Have you looked at Pinterest lately? Been to a supermarket? How about to any restaurant on the planet? Unless you’ve been living under a rock (hey, Patrick Star! ), you’ve likely noticed that Butternut Squash is taking over the world. This fall favorite is literally everywhere and for the longest time I didn’t understand why. With acorn squash, delicata squash, and all the other beautiful, colorful, weird looking squashes, why on earth does butternut become the object of everyone’s affection the second the first leaf turns orange? Well, I’ll tell you why. It’s because butternut squash is really friggin’ delicious. I suppose that whole “it’s what’s inside that counts” self-esteem mantra applies to the flora community too. Maybe it’s just me, and I know I sound insensitive here, but butternut squash is ugly. That awful outer color reminds me of the Peach Crayola marker and it lacks the funky ridged and speckled texture of its other squash compatriots. Peel that bad boy, chop it up, and toss it in the oven though, and it’s like someone put this squash on an episode of Queer Eye For The Straight Guy. A drip of olive oil, a sprinkle of salt and pepper, and half an hour in the oven later and you wouldn’t even know that this was the ugly duckling of the squash family! The buttery (oh, I get it now) texture and the nutty sweet flavor make you feel all warm and fuzzy…almost making up for the fact that the temperature outside is dropping faster than you can finish your dinner. I could have eaten this whole sucker unadorned, but I had business to attend to. I happened upon a Trader Joe’s recipe similar to this one, and thought that if TJ’s had hopped the butternut squash wagon, I probably should, too. That said, their recipe called for about a gallon of Alfredo sauce, and that, thank you very much, is a wagon I hopped off of when I happened upon the nutrition facts (or lack thereof) a few years back. Instead, this lasagna takes a more traditional route, with tomato sauce and a spinach and ricotta blend. It may sound like the same old same old, but I promise that the squash brings new life to this Italian dish. Think sweet, creamy, and cheesy with a hint of spice. The three vegetables in this recipe (squash, tomatoes, and spinach) create an unlikely trifecta, balancing out each other’s flavors. 2. Peel skin off of squash and slice in half, the long way. Use a spoon to remove the seeds and discard. Cutting in the opposite direction, slice squash into half-inch, half-moon slices. 3. Place squash pieces on a non-stick cookie sheet. Use a basting brush to lightly coat both sides of squash in olive oil. Sprinkle with salt and pepper. Bake for 35-40 minutes. 4. While squash is roasting, heat 1-tablespoon olive oil in a large skillet. Once hot, add spinach and toss to coat. Sautee until spinach is wilted, but still bright green. 5. 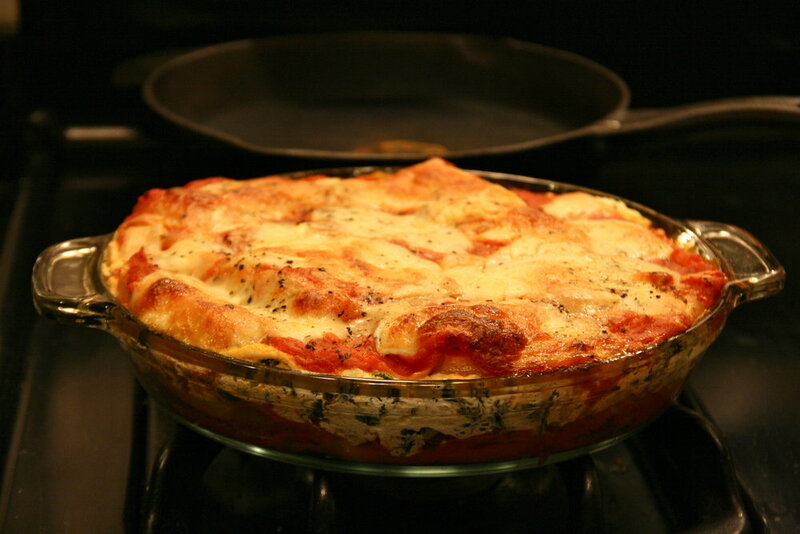 In a small bowl, combine spinach and ricotta, using a spoon to thoroughly mix. 6. 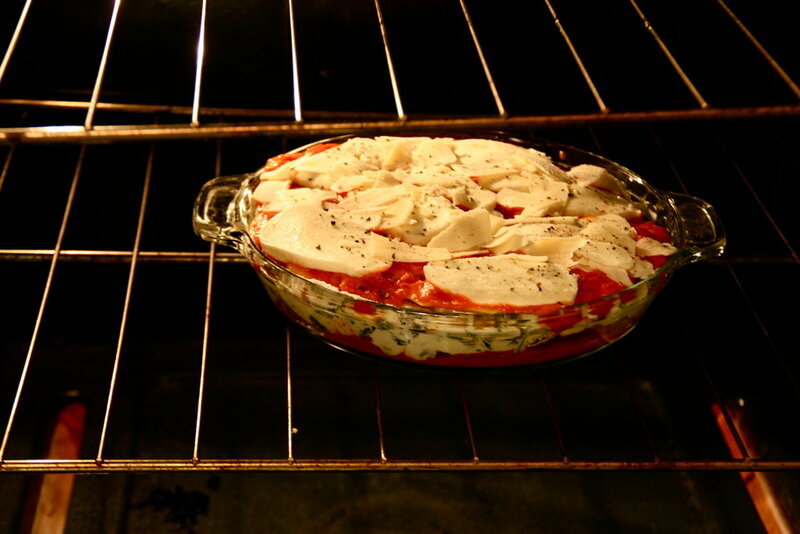 Line the bottom of a medium/large baking dish with lasagna noodles. 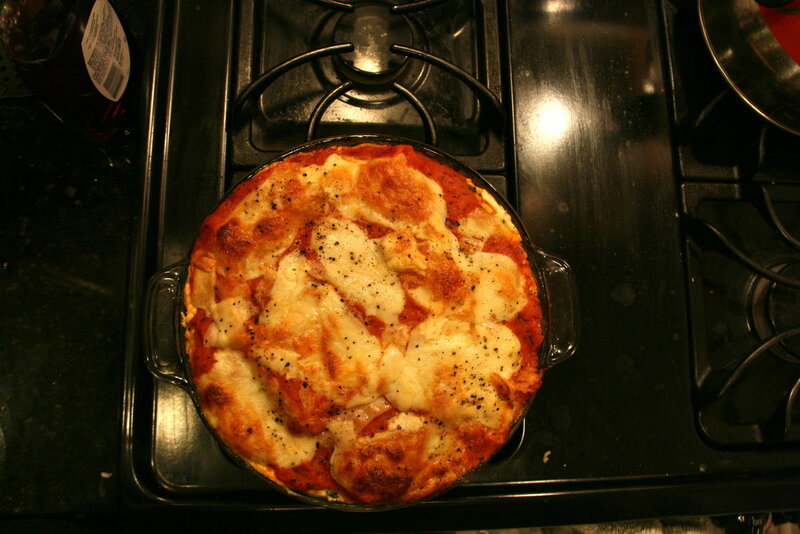 Top with a layer of tomato sauce. Add another layer of noodles and then one of the spinach and ricotta blend. Cover surface with all of the squash, pressing the pieces into the spinach/cheese mixture. Top with another layer of noodles. Finish off with a layer of tomato sauce, covered with mozzarella slices and top all with Parmesan. 7. Loosely cover with foil and bake in the 375-degree oven for 40 minutes. Lasagna is done when cheese on top is bubbling and brown.